Learning HTML and web design is easy if you have some reference point to work with. That's why we built the "Learn HTML By Example" tool, a free tool you can add to your web site. It's easy to use, and there's a bunch of examples already built in. Learning HTML and web design is easy if you have some reference point to work with. That's why we built the "Learn HTML By Example" tool, a free tool you can add to your web site. It's easy to use, and there's a bunch of examples already built in. You just type in some HTML code in the middle box, and it immediately displays in the right box, exactly as it would look as a live web page.Below are just a few of the many uses we've found for this tool: 1) Seeing how different browsers display the same code (just try it in Internet Explorer and FireFox) 2) Add it to your web site for a great way to keep visitors around. 3) A quick reference for commonly used HTML elements and syntax. 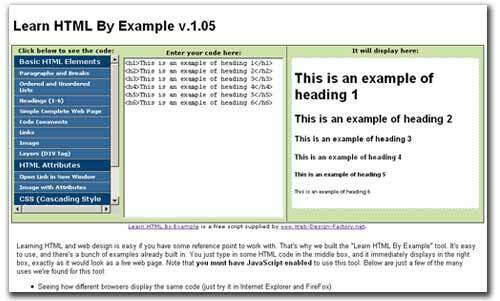 4)Great way to teach the basics of HTML to staff, friends and family 5)Test code before going live with your web site.